SoftPlanet makes it possible for everyone to get free Samsung Link download directly from our servers. There is no registration needed for downloading. Samsung Link 1.8.1.1405191947 is a new generation software application, which enables all Samsung DLNA-compatible devices to connect and gain access to the same than. This program replaces its predecessor AllShare. Now Samsung Link is the one that offers the features of AllShare and comes with some new as well. If you have a Samsung device, you definitely should have it. The biggest advantage of Samsung Link is that it enables you to easily search and find all your stored content and manage it wirelessly. Besides that you can also view, play and send your files from one to another device or access saved content on storage services like Dropbox. You can use Samsung Link for streaming photos, music and videos stored on a registered device or web storage service to any connected device. The web-based GUI of the program is very refined and organized. It comes with a sidebar, which includes four sections – Registered storage, Registered devices, Nearby devices and Settings. The pane right next to it is divided in five tabs – Photos, Music, Videos, Documents and Files. Thus you will have your files organized easily, which will shorten the time required to find anything. In addition, there is a search field, which will help you in your search too. Keep in mind that Samsung Link works in the system tray too, where you can access the Nearby device connection settings menu. As you have probably noticed, Samsung Link 1.8.1.1405191947 requires Internet connection and a web browser in order to run it in there. We strongly recommend that you choose some proven browser such as Mozilla Firefox, Google Chrome, etc. Samsung Link seems to work properly without any major challenges. We didn't encounter anything wrong with its working process either its graphical user interface. 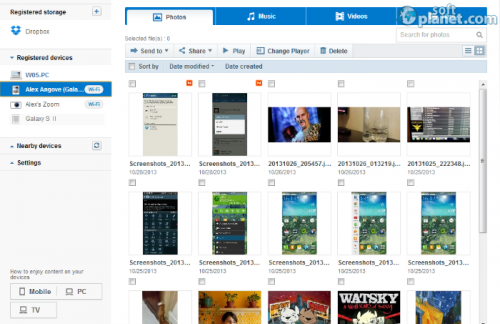 Samsung Link is the latest file sharing utility from Samsung, which will help you access stored multimedia from any connected devices. It is free and very intuitive, so you won't have any difficulties to work with it. Please share your opinion with us within the Comment section down below. Our security scan shows that Samsung Link is clean from viruses. The current version of Samsung Link has been scanned by our system, which contains 46 different anti-virus algorithms. That ensures that Samsung Link 1.8.1.1405191947 is 100% safe for your computer.